World War I wargaming… If you ask some gamers to describe what WWI wargames are like, you might hear some common words like: mud, trenches, barbed wire, attrition, and poison gas. Some may even describe the games as slow, static, tedious, or long grinding setpiece battles. A common belief (indeed one I previously held) is that whatever World War I wargaming is, there was certainly one thing that it’s not: dynamic. This has a lot to do with assumptions make about this period of modern warfare. Even as wargamers, we tend to make assumptions about the Great War that are simply not founded in history or wargaming. I was no exception, believing several misconceptions about Great War gaming. Don’t get me wrong, I love World War I as a subject. It’s actually the historical event that inspired me to study history at university in the first place. But I did have reservations about World War I as a company-level wargame. I believed four basic things got in the way of a fun WWI game. 1. World War I games are a grind with constant artillery bombardments. 3. Attacking infantry constantly have to assault heavy machine-guns. 4. Tanks are super rare, plodding along, and barely able to support infantry. Over the years, talking with Phil and Wayne, I came to realise that all four preconceptions about WWI wargaming were largely, and happily, unfounded. World War I warfare was very dynamic, especially in 1918, with a lot of action and reaction. 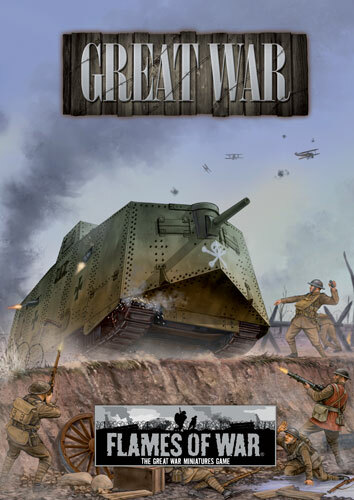 Let’s have a look at these and bust some myths about Great War gaming. A common fear with World War I gaming is how artillery is handled. Personally, this was my number one concern. I think my worry had a lot to do with the fact that WWI was one of the first wars where shrapnel was the largest causes of casualties in a war, so I assumed that artillery did most of the fighting. I didn’t want to see games devolve into artillery parks slugging it out over the heads of the infantry. This makes for a boring and tedious game, so I put this high on my list of things to consider. Turns out, history has the answer. I was approaching the problem with the knowledge of WWII artillery tactics and capabilities. WWI artillery was indeed prolific, firing thousands of shells in harassing and preparatory bombardments. It proved to be invaluable for helping get the infantry close to the enemy. Once the infantry was in, they ceased firing or carried on rolling the barrage beyond the trenches to interdict reserves and enemy artillery. Furthermore, the communications capabilities of the field artillery were limited to carrier pigeon, phone lines and incredibly unreliable early radios. In the end, WWI artillery was simply not the flexible tactical weapon that it was in WWII. In Flames Of War terms, this means that the WWI artillery’s main function happens before the game actually begins. This is reflected in the Preliminary Bombardment special rule where the defender starts the game Pinned Down, owing to the mind-numbing effect of the barrage. This is also why the attacker starts so close to the enemy trenches, having followed the rolling barrage right up to the enemy front line. The artillery has guided the infantry to it’s assault position and the game is on! So, you might ask, why have artillery at all? There were occasions where artillery batteries were the objective an assault. It is for this reason we’ve included them as an option to take with your forces. When attacked, the batteries fought hard and were well-defended by infantry, so we wanted to make they got to see some action. Plus, they played a key role in anti-tank defence, so they are quite useful in that way as well. One of the first things people think about when you mention WWI is trenches and static warfare. Static battles were also one of my biggest fears about World War I gaming. Two sides are dug in facing each other, both within grenade-throwing range. Heavy machine-guns on both sides have locked down no-man’s-land with interlocking fields of fire. The first side to step into no-man’s-land was already dead—it was only a matter of time. However, looking at the battlefields of 1916-1918, the trenches were placed quite a ways apart. They were rarely within accurate rifle-range, and certainly not within reach of a grenade toss. So assaults were not launched directly from one trench to another after a few steps across no-man’s-land. The attackers had to leave their trenches behind, cross a large amount of no-man’s-land, and then assault the defender’s trench. When designing the new Great War missions, this led us discard the attacker’s trench line, and focus the action on the defender’s trenches. This results in quite a dynamic game, with the attacker having no choice but to assault the enemy trench in order to win. Sitting back and picking off the defenders with rifle fire is not going to work, so it’s time to fix bayonets! The machine-gun was certainly a huge leap forward in infantry firepower when it entered into wide-spread use. They drastically improved the chances of defending infantry to hold out against enemy assaults. During the early days of trench warfare, the machine-gun was an unconquerable force. However, it didn’t take long for both sides to start developing an antidote. My concern here was that with so many weapons with low firepower ratings (the bulk of them having Firepower 6), heavy machine-guns were going to be an automatic win option. Hard to kill and impossible to silence, the HMG will rule the battlefield, cutting down attacking infantry with their long range and high rate of fire. The solution in the game is same as it was in history: the simple trench mortar. What I didn’t realise before was just how many of these weapons were produced and how common they were on the front. I had seen pictures, but I assumed they were simply trench artillery, there to support the rolling barrage and nothing more. When I dug a bit deeper, I found that the trench mortars’ role was to support the attacking infantry by neutralising enemy strong points and nests. Adding trench mortars will get things moving for assaulting infantry, and restore balance to the gun battle over no-man’s-land. Of course there is one more solution to deal with machine-guns: tanks. It’s well known that the Great War ushered in the modern tank as a weapon of war. These tanks are iconic and wonderfully awkward. We sometimes forget that the Mark IV and A7V tanks were the cutting edge of modern technology. They were the highest symbol of combat power, demanding the attention of everyone on the battlefield. I don’t know why, but I’d always assumed that tanks were rare on the battlefield, maybe a couple of dozen per nation. However, looking into the numbers I was blown away with not only how many tanks were built, but just how many were committed to battle. When tanks were committed to an assault, they didn’t do anything in half-measures. Both sides used the tank as a breakthrough weapon, so their natural position on the battlefield was leading an assault, not distributed piecemeal across a wide front. For example, at Villers-Bretonneaux, the Germans committed all three of its A7V battalions to the battle, a total of 13 tanks. While these battalions were split across three attack divisions, the tanks of each fought close together in batches of three, four, or six tanks. For their part, the British and French had even more tanks and committed hundreds to important attacks, especially in 1918. So, in Great War Flames Of War games, an infantry company at the cutting edge of an assault are perfectly justified to be supported by several tanks. Not only are they are a very important tool to consider for breaking through the enemy’s trenches, but they are amazingly fantastic models to paint and field! Generally speaking, gas attacks fall outside the scope of Flames Of War. Fighting in gas masks is very difficult, so gas bombardments were kept away from the area that was about to be assaulted, as gas would make the difficult task of taking a trench that much harder! Gas was a usually a component of the preliminary bombardments, used to suppress enemy artillery and reserves. The effect of gas in Flames Of War suppresses and disrupts the enemy and then dissipates. So gas bombardments are wrapped up in the Preliminary Bombardment and Delayed Reserves special rules. It’s easy to envision the WWI battlefield as mud, pools of water, and shattered trees, crossed by trenches and barbed wire. This led me to think that I’d needed to build a new wargames table for World War I (not to say I didn’t welcome the opportunity). While this image of muddy fields is certainly true for some areas of the front line, they were only a small fraction of 1918 battlefields. The breakthrough battles of 1918 were more often than not fought over ground relatively untouched by war, so getting into Great War gaming is rather easy using your existing collection of 15mm terrain. This project was a delight to work on. I’ve rarely been so happy to be so wrong about a period of wargaming. Great War gaming is indeed dynamic and fun. 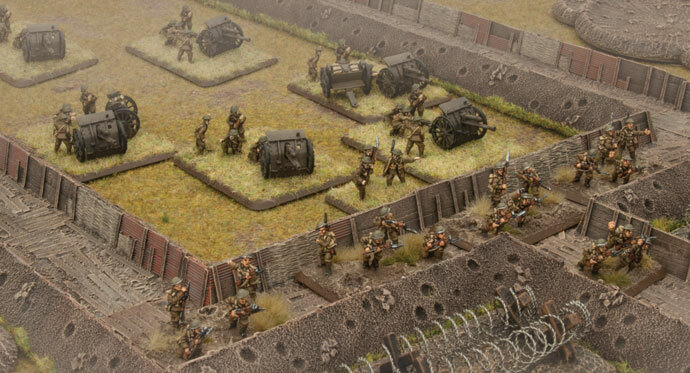 With this supplement for Flames Of War, you’ll find that your infantry are the key to success. They are armed with the most advanced tactics and equipment of the time, and they are ready to go Over the Top and end this long war.